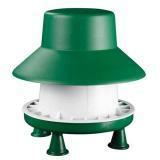 Ideal for small backyard or hobby flocks. Supplied with grill and a set of 4 push fit legs. 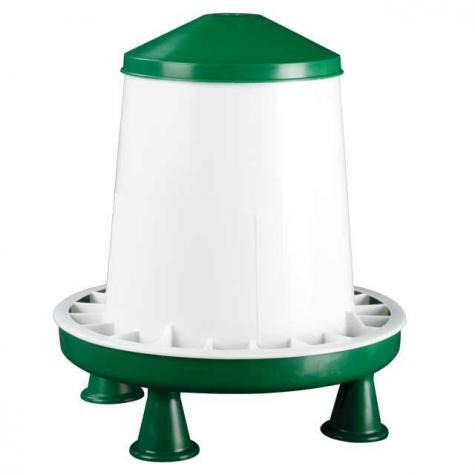 Protect your chicken feed and reduce waste by using a Blenheim Rain Hat with the Blenheim Feeder. Finned base and outer ring prevents birds from flicking out feed, thus reducing waste and mess. Feeder will accommodate most breeds of poultry as well as some smaller breeds of waterfowl. This feeder has it all! Large capacity, grid to keep feed in and a lid( at NO extra charge). 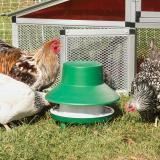 The 12.5” diameter feeding base allows for my 6 Orpington chickens to feed comfortably at the same time. The snap on feet at the bottom work well for placing the feeder in the coop at night( my girls are still growing and I want them to have access at all times). 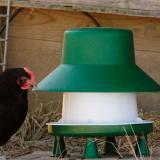 The hanging feature is great for outside the coop in their run to keep mice from accessing the feed. Only complaint is that Premier 1 doesn’t have better deal on shipping costs. Our chickens destroyed these feeders with just a few days of use. We were very disappointed and surprised. The photos show a much thicker white plastic divider where the chickens reach in to eat. The product we received had a paper thin white ring that didn't lap over the green base. Due to the thinness of the divider, it was split, broken, and dangerous within a very short period of time. This site unfortunately doesn't allow users to add photos with reviews. 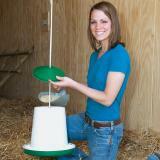 The rain cap doesn't properly attach to the feeder, rather just weakly sits on top. It is easily knocked off. 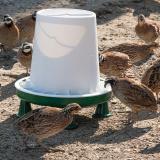 Additionally, with the rain cap on top, there isn't a way to carry the feeder from the top, making it clumsy to handle with just one hand. Finally, the feet are pressure set, but come off a couple times a week. I ordered the Blenheim and Rain Hat for my ladies with hopes of cutting down the food waste. Upon recieveing the above, it was very easy to assemble. I filled up the feeder, placed it in the run, the Ladies did not know what to make of it, but soon were feverishly eating out of it. Some one did knock the Rain Hat off the feeder (luckly it was not raining in the PNW), I know who the suspect is, otherwise everything is working great! I'm very happy with our purchase and thank you for your company. 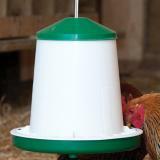 I purchased 4 feeders & highly recommend them as they really keep feed waste down. Only received 3 caps & called customer service and they were great, shipping missing lid same day as call. This feeder works well, the hat keeps the food dry - my only issue is the chick feed doesn't flow out like it should but that may be because it's chick feed and I want to use all this feed up. But otherwise, it's great for our six girls.